NeuBible is a beautifully crafted Bible app that puts the reading experience first and foremost. Although it is feature limited, the search feature and distraction free minimalism make it an incredible app. 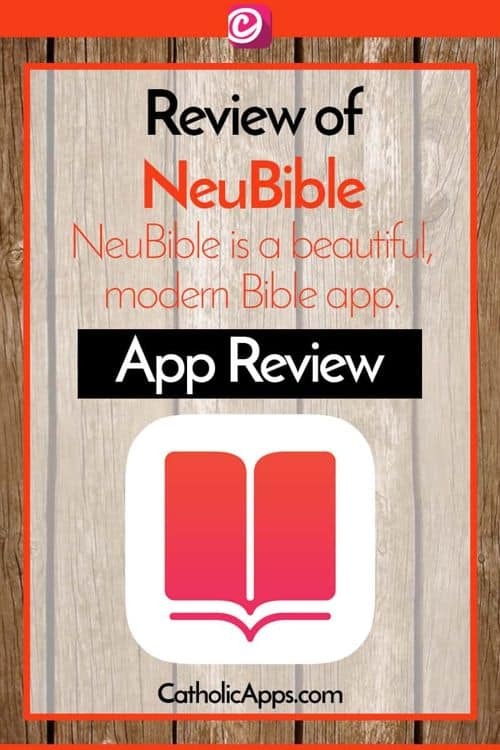 NeuBible – Summary: This particular Bible app is incredibly smooth, it is top notch design, and layout, really well thought out. There are many Bible Apps out there and they each have a role, studying scripture, making and remembering notes, and like this one reading scripture. This app takes the clutter, the inline linking, the click for ten times more information, out of the picture and just brings it down to one task. Reading Scripture. Navigate easier, read easier, and pray easier. NeuBible places an emphasis on readability, like a number of other startups. Readability is probably the main feature of this app (and it’s a much needed one). 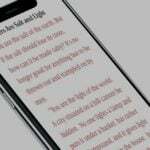 Unlike other Bible apps, even ones that we have reviewed on CatholicApps.com, NeuBible gives you control, even down to the font size/type and line height. The default settings do look the best, from my usage of it. NeuBible is a beautifully crafted Bible app that puts the reading experience at the front of the line. Some things may be missing that the other bible apps have, the search feature and distraction free minimalism make it an incredible app. Getting around in some apps can be maddening, but with NeuBible’s spine navigation, it’s easy to remember where you are. Plus, you’re always within a thumb’s reach of where you need to be, (and it’s even easy to use with the larger screens of the iPhone 6 & 6 Plus). 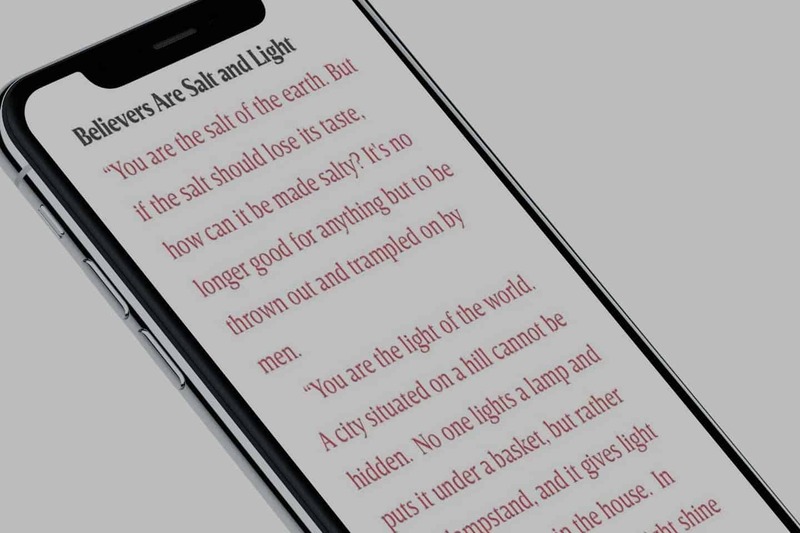 NeuBible is a Bible app from the two man team of Kory Westerhold, a UI designer at Apple and Aaron Martin, a design director at Yahoo. Their app came from looking round at the different Bible apps people were using and thinking that the design could be vastly improved. It is meant to be streamlined and clear. It isn’t so much for references and concordance, but works awesome and excels at reading. It works particularity well for devotion and prayer time, because it is so distraction free. Beautiful clean text has both a light and dark reading mode. Simplicity also means that the social aspect of many bible apps is gone. The pretty share a version isn’t here, this is a minimalistic app that focuses you on reading the bible. I love it that way. I know that if I wanted to share things out I’ll grab another bible app to do that. Some of the other bible apps are so over loaded with features, this is simple. If in I am in a study and the leader says open to Mark 6, in seconds I can get there. Just a few swipes. Search. The Nubile has an unbelievable Search feature. It is simple and comprehensive. With NeuBible’s world-class Quick Search, there’s never been an easier a way to find what you’re looking for. It is like search features built into MacOS (“Spotlight”) and Windows 10. Whether it’s verses, books, keywords, or even people — live search results will appear in real-time as you type. Here is a pro-tip: Double-tap to Search. Instead of swiping back to books for search, simply double-tap the screen. It’s fun, easy to use, and makes for lightning-fast navigation when you’re sitting in church and need to get to a verse. Dark and Light Mode sample image. Dark and Light Mode settings are easy to use, here is a look at the settings page. Dark and Light Mode settings are easy to use, and you can adjust the fonts as well. Bible Translations are available through in app purchases. Other than the WEB Edition, all of these are downloads right to your device. Turn off the verse numbers. To make reading much easier. Change colours on the spine (left side). It has a dark reading mode. Love the quick swipes to chapters and verses. The universal search is great. Searching by book verse or keyword, name, these make it easier to use! The developers put a big emphasis on design and typography and honour Gods word with a beautiful app. Personalize it to your own colour. What an enjoyable experience to read the bible with this app. There isn’t a specifically Catholic bible included in either the default included one or the ones from in-app purchases. It has been requested but there are licensing fees, and likely a complicated mess of who to talk to and who to ask. I will ask the question though that the developers are certainly asking, does having a not specifically Catholic bible available to me stop me from enjoying the Word of God? For me the answer is no, especially when the design of this app is of such high quality. Is This The Catholic Bible App Of The Future? It could be the developers on twitter have said that they plan to add in a Catholic version, but I wouldn’t hold my breath for it, it has been a over a year to add it in. I love being able to just read scripture without all the bells and whistles. This app does that for me. I love it, I hope you do too.